IF YOU WIN, WE WIN. IT IS REALLY THAT SIMPLE. IP Group AB develops, sells and leases smart and cost-effective packaging systems (pallets, pallet collars, crates) in plastic and aluminium for companies in Sweden and Europe. Our products are made from 100% recyclable plastic and aluminium. Concern for the environment and our customers' health and safety requirements take first priority when we develop new products. We focus on continuously improving all our processes to meet the high demands put on our products by our customers and other stakeholders. We aim to comply with environmental laws and other requirements imposed on us. We strive to deliver flawless products to our customers in the time agreed. 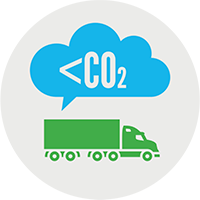 We will reduce our carbon emissions by optimising our transport and that of our customers. Our return system enables our customers to reduce their carbon emissions. We are certified according to ISO 9001 and ISO 14001. Read more about our Environmental Pallet. IP Group's patent-pending Environmental Pallet won the 2013 WorldStar prize for the world's best transport solution. The prize is awarded by the World Packaging Organisation (WPO). WorldStar is the world's most prestigious packaging competition. The fifty four international WorldStar winners meet in Sydney, Australia, to receive their awards. In 2013 our environmental pallet also received the ScanStar Award for the best Nordic transport solution. "The secret lies in the Environmental Pallet contributing to improved economy, better environment and better workplace health and safety all at the same time. We are talking about 40 per cent fewer return transports, 40 per cent better stackability, 40 per cent reduced weight, 40 per cent reduction in carbon emissions and 100 per cent recycling and reutilisation. THANKS, ALL YOU ENVIRONMENTAL PALLET USER! If you use the Environmental Pallet as your loading pallet then you will feel proud to know that you are making a good environmental choice. Its low weight and supreme stackability gives you 40 per cent fewer returns, thus reducing your carbon footprint by 40 per cent! Since the launch of the Environmental Pallet and until today 4/19/2019, its users have contributed to reducing CO² emissions by a grand total of 1 449 819 kg. And the kilos continue to tick for each Environmental Pallet that enters the system.